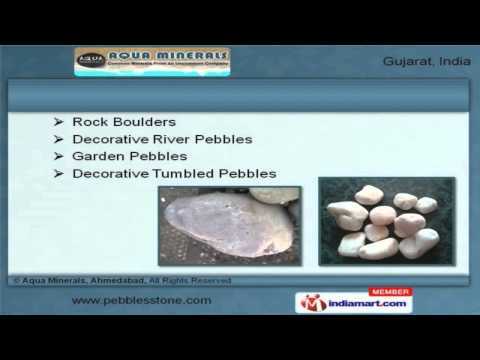 Welcome to Aqua Minerals, Manufacturer and Exporter of Pebble, Decorative Stone Chips and Water Filtration Media. The company was incepted in 1998 at Ahmedabad. Our Effectual business methodologies and Contemporary infrastructure facilities make us different from others. Ethical business standards, vast domain expertise and Expedite delivery schedules are the factors that help us to stay ahead of our competitors. We offer a wide array of Pebbles, Gravel Stones and Water Filtration Media. We are known in the industry as the manufacturer of Rock Boulders, Decorative River and Tumbled Pebbles. Polished Decorative Pebbles, Dolomite Powders and Gravel Stone for Pathways are a class apart. We also provide Silica Sand for Water Filtration, Gravel and Silica Sand Suppliers that are extremely reliable. Unpolished Stone Suppliers, White Polished Pebbles and Landscaping Stones are some of our best selling products. Our organization is specialized in manufacturing a qualitative range of Stone Chips, Aquarium Stones and Foundry Sands.